Reissue of 1974 circus themed concept album! 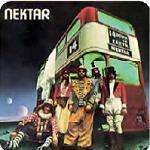 More information: The long awaited reissue of the high flying, 1974 circus themed concept album from prog rock ringmasters Nektar! Features a guest appearance by Hawkwind lyricist/jester Robert Calvert and contains 7 bonus tracks including the original mixes of nearly the entire album PLUS outtakes tracks, all packaged in an attractive o-card with full colour booklet and detailed liner notes.